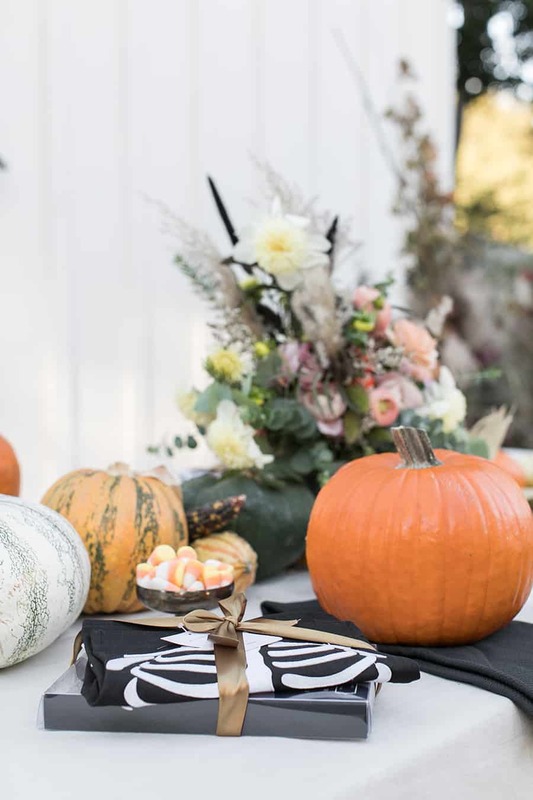 Sharing some fun ideas on How to Throw a Pumpkin Carving Party and Pumpkin Carving Party! 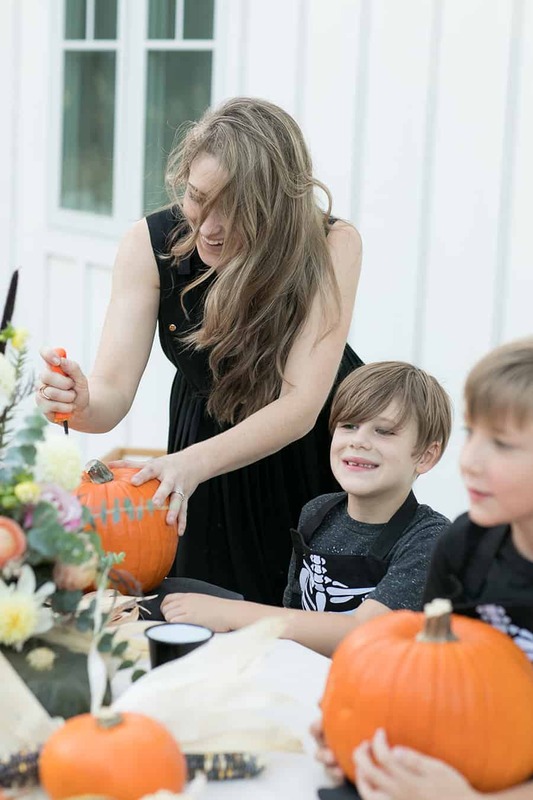 We’ve been hosting a pumpkin carving party for the past 5 years and it’s one party my family looks forward to every fall. 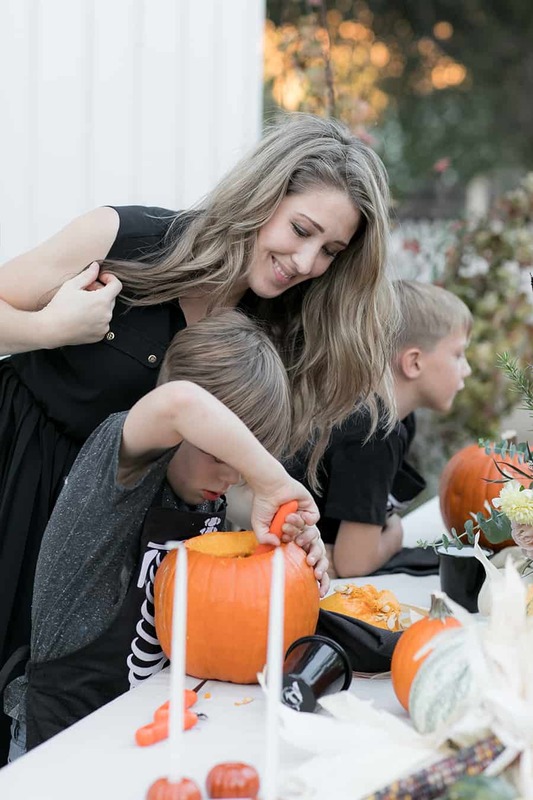 We invite a few friends over with their kiddos and the entire evening is spent outside, carving pumpkins, eating chili and of course, lots of dessert! 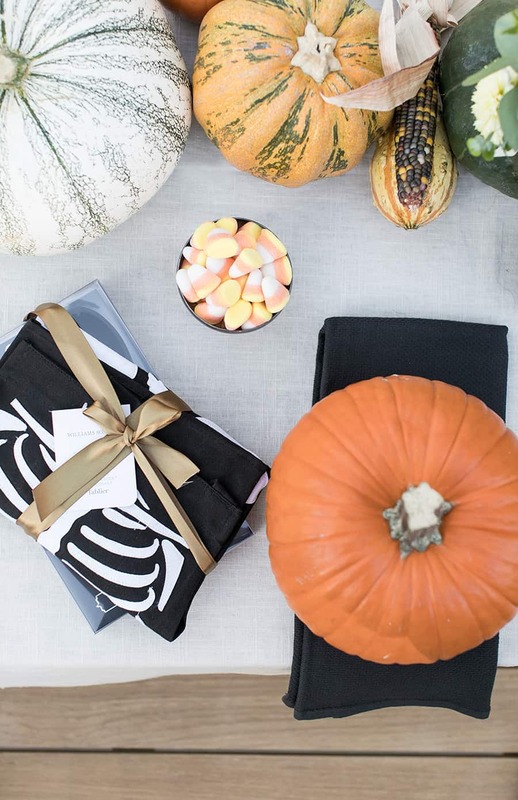 This year I ordered cakes, cookies and candy from Williams Sonoma to make it even easier! It was all delicious! Did you even know they sell cakes?! 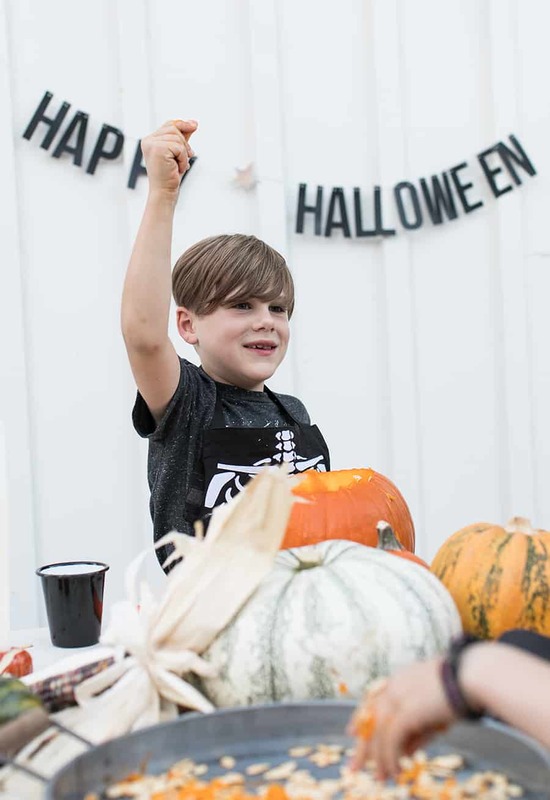 For the pumpkin carving party invitations, check out Paperless Post and Evite. 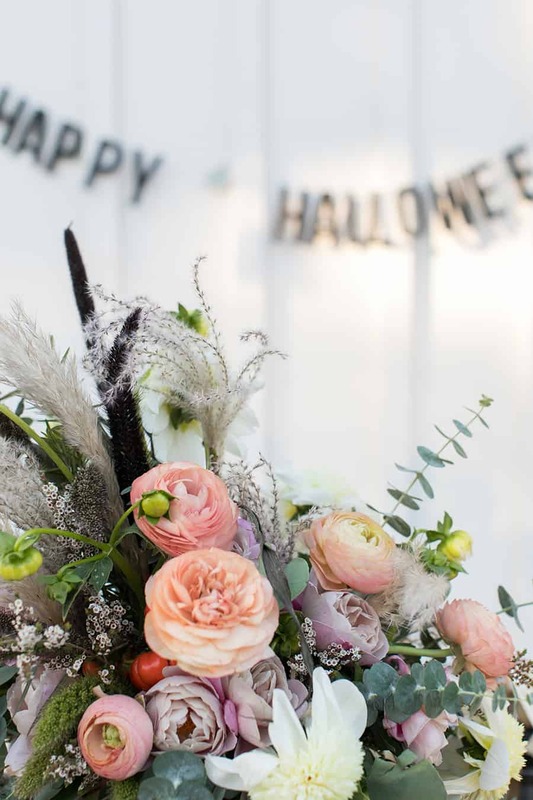 They both have great online Halloween invitation ideas that are easy to send, trackable and great for communication prior to the event. 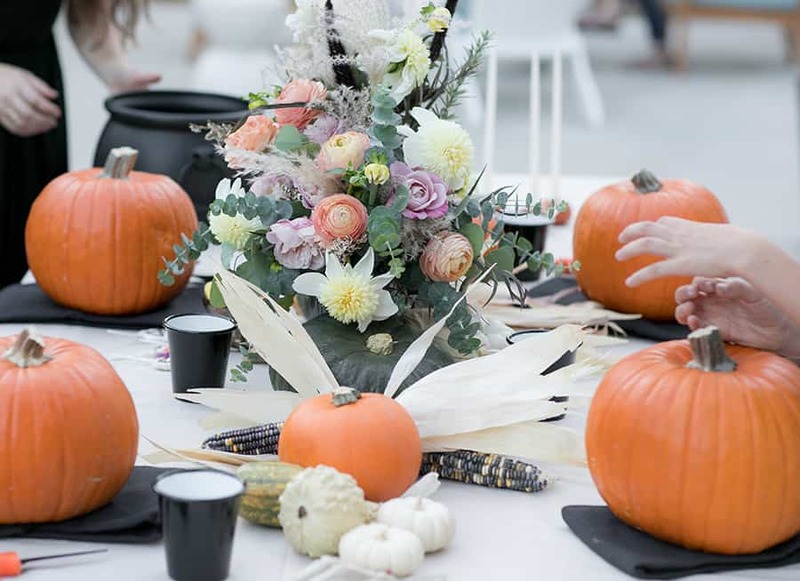 Since carving pumpkins can get very messy, hosting it outside is ideal. 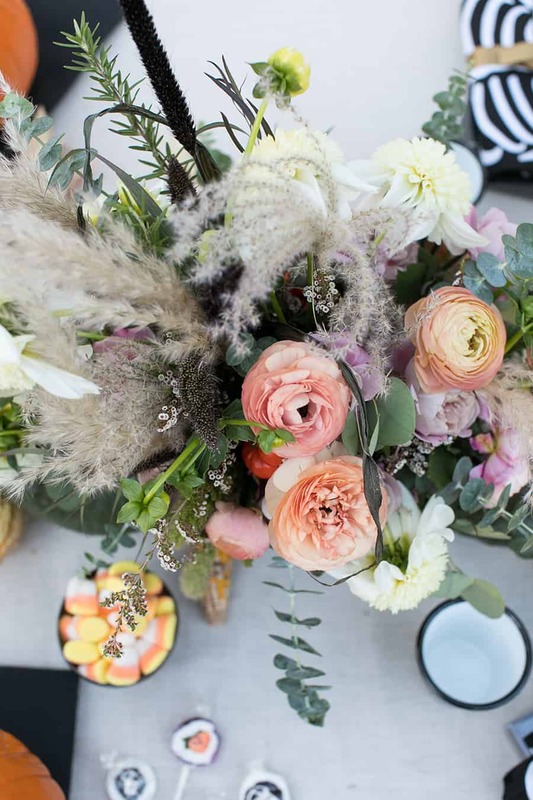 Layer fabric over a table to keep the table clean. I bought yards of fabric at the craft store to use for the table. 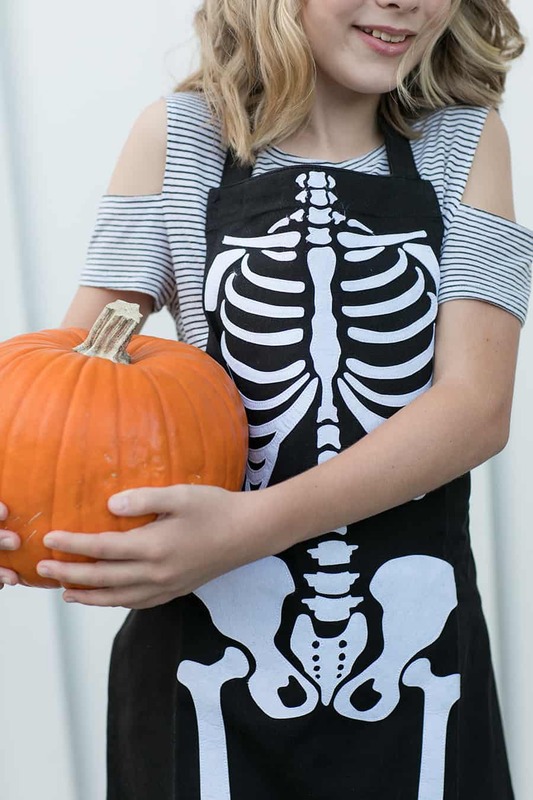 Create a Pumpkin Carving Kit for the Kids! 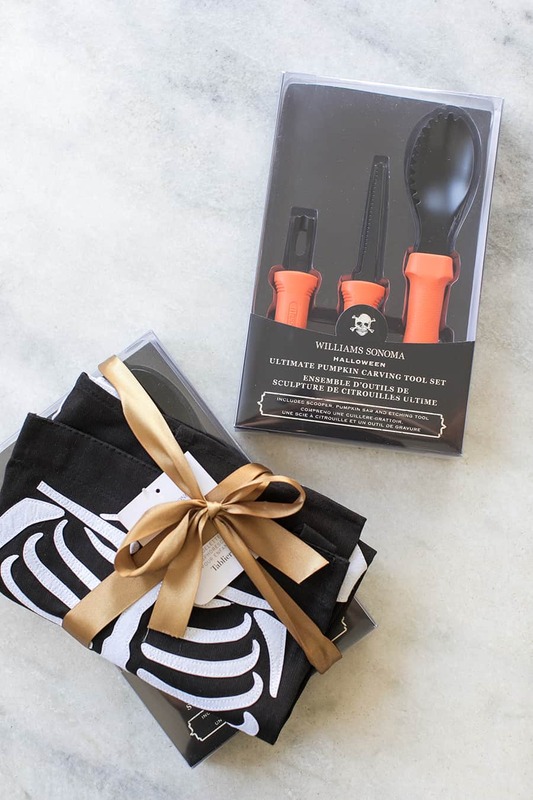 Our pumpkin carving kits included a glow-in-the-dark skeleton apron for the kids and heavy duty carving kits, both from Williams Sonoma. 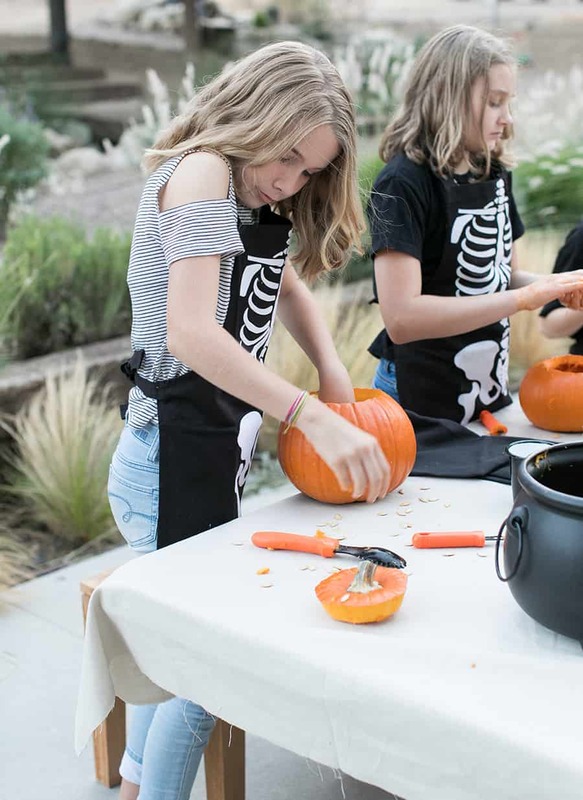 Each table setting was set with a pumpkin for carving, a black towel for messes and a carving kit, with their own apron. 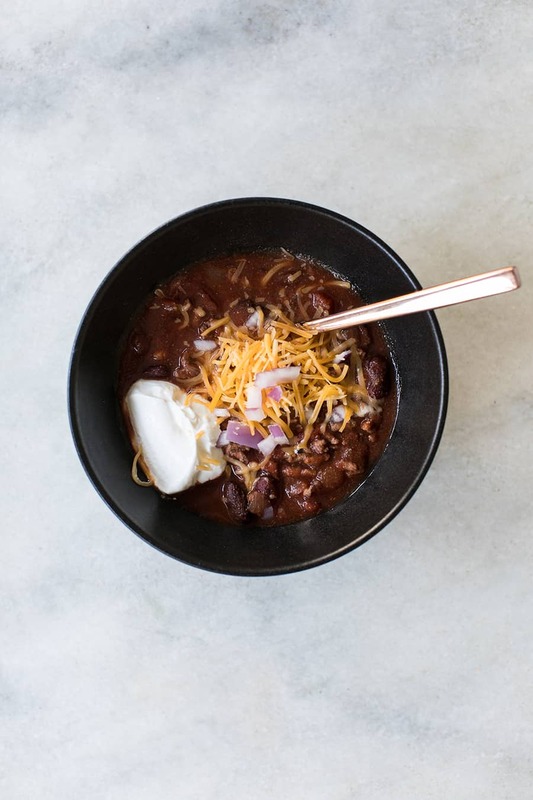 Chili is a must for a pumpkin carving party. It’s not a pumpkin carving party without the chili! This is our favorite recipe and you can make it in a slow cooker. 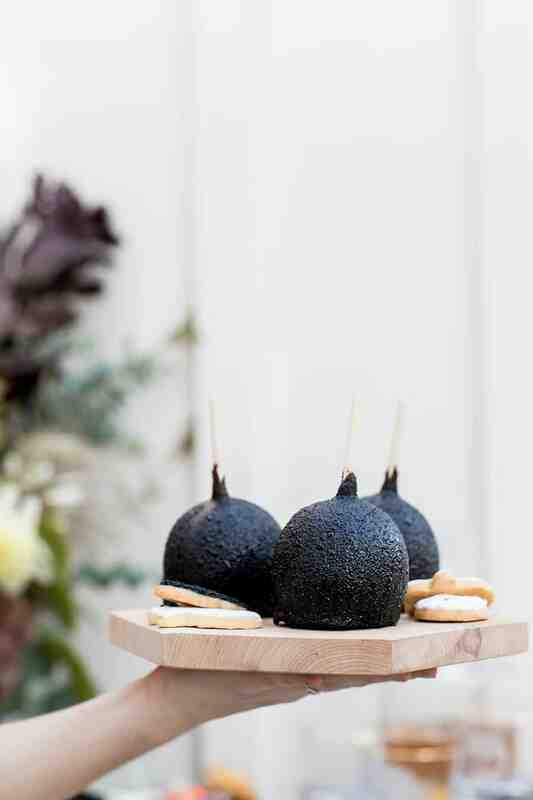 We served it in Apilco Reglisse black bowls with copper spoons. 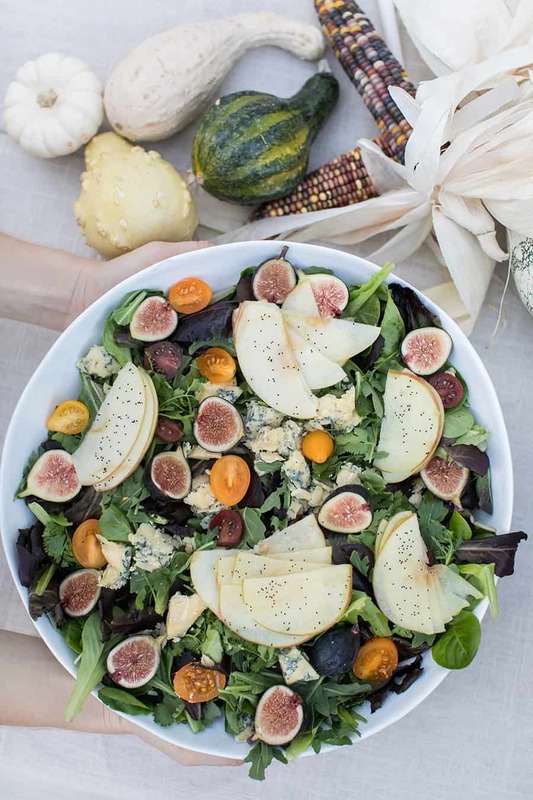 Also to include on your menu is cast iron corn bread, cheese platter and a beautiful fall salad. For this kind of party, keep it easy and order dessert! I ordered all of the desserts for the party from Williams Sonoma. They also have the best Halloween candy selection! 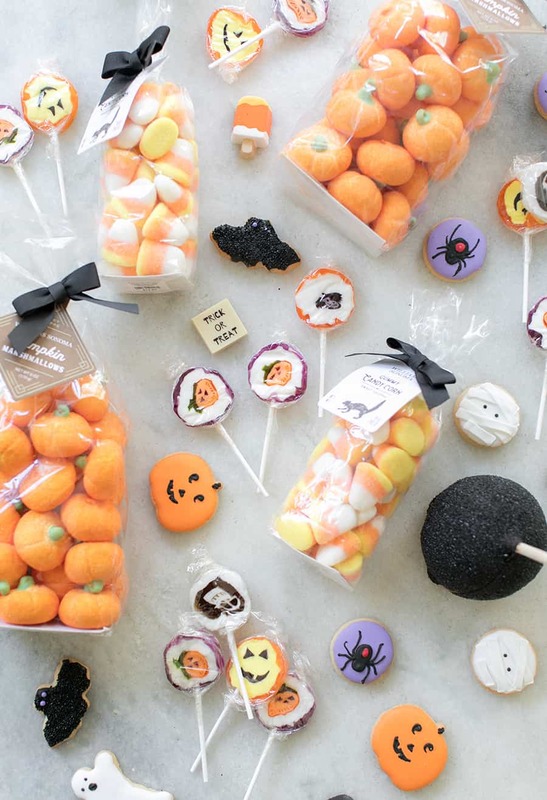 We served pumpkin marshmallows, candy corn gummies, Halloween lollipops, Halloween sugar cookies and the cutest chocolates you’ve ever seen!! 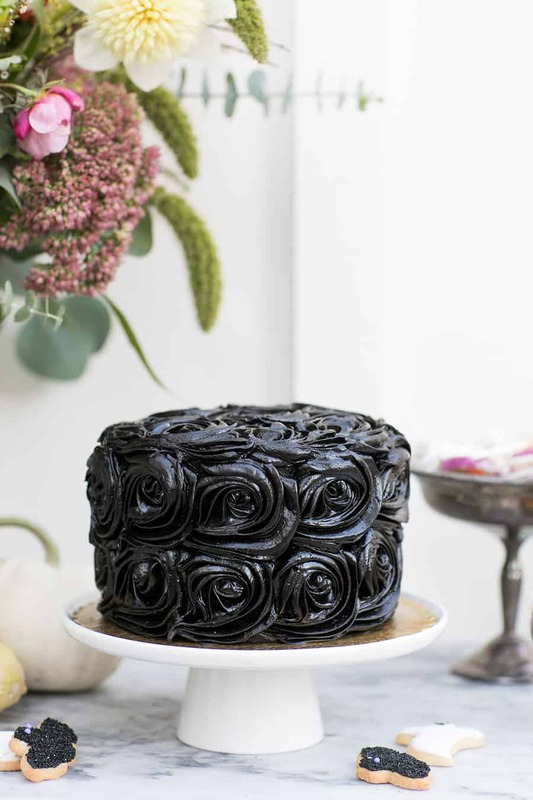 For the main dessert, serve something show-stopping like this Black Rose Red Velvet Cake. 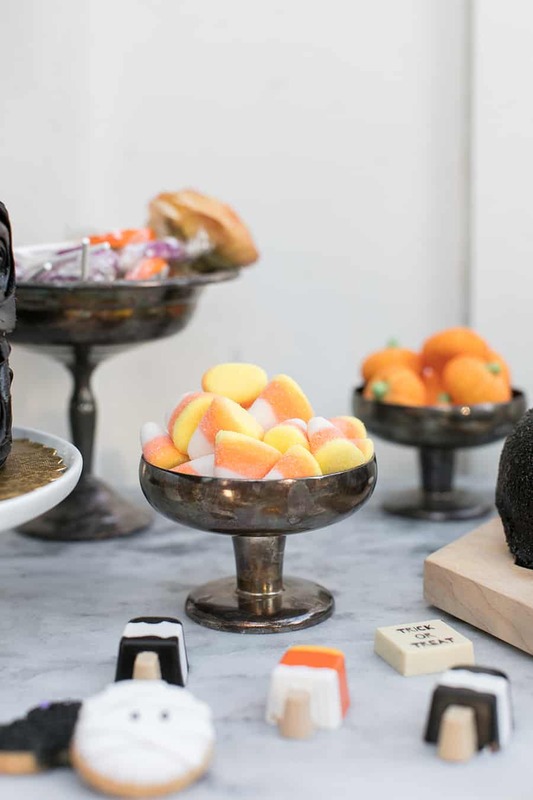 It was delivered from Williams Sonoma and I kept it in the freezer until the day of the party. 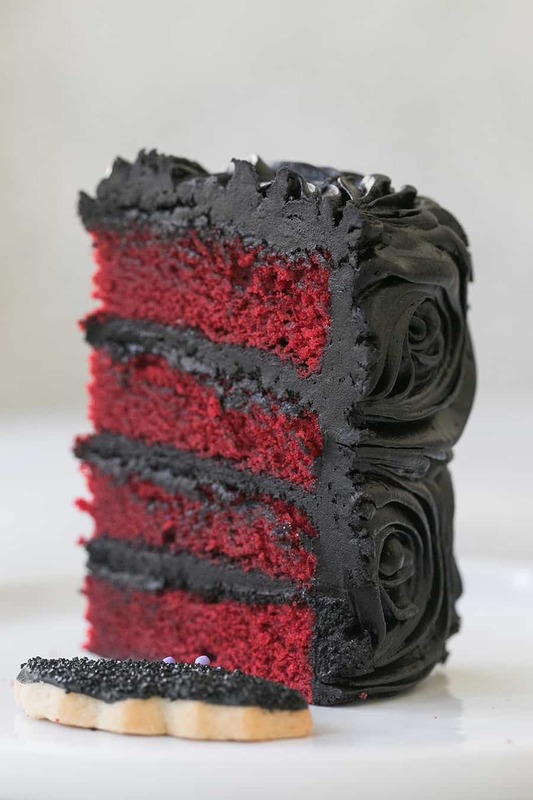 It was so moist and had delicious layers of red velvet cake. It tastes even better than it looks! 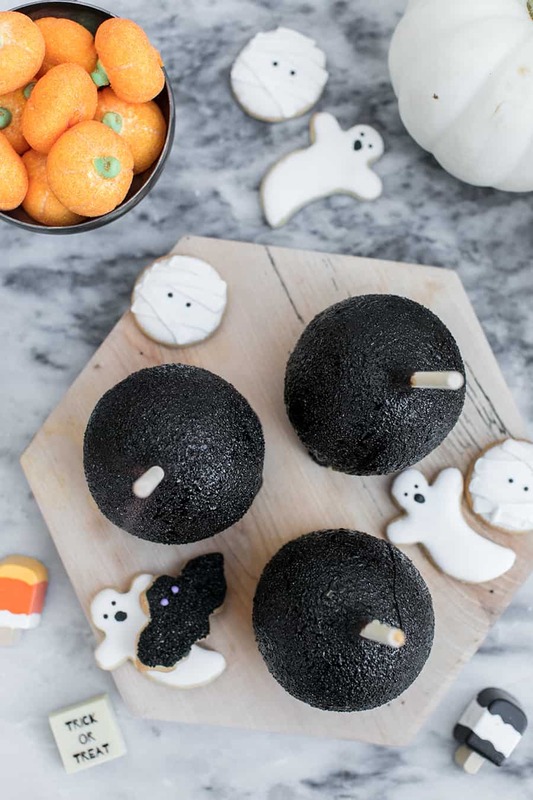 They have several Halloween cakes, you can see them all here. I couldn’t resist these caramel apples from Maggie Louise! 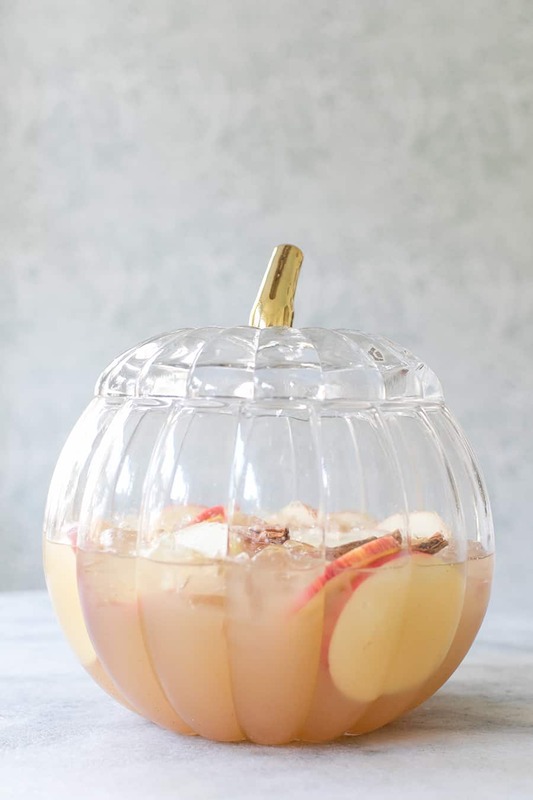 Since the pumpkin party is for adults too, I made a batch of hard apple cider kombucha punch and served it in a large glass pumpkin bowl with copper mugs to keep it extra cold. 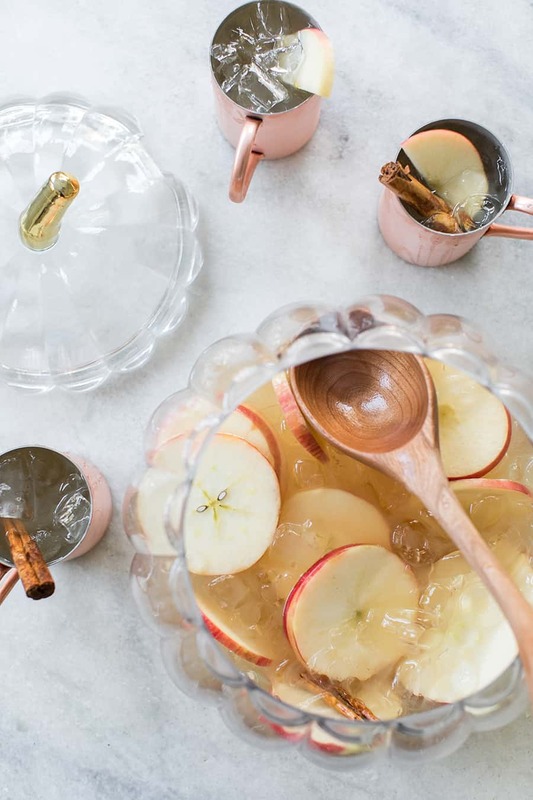 It’s such a delicious fall punch recipe and perfect for parties! You have to try it! 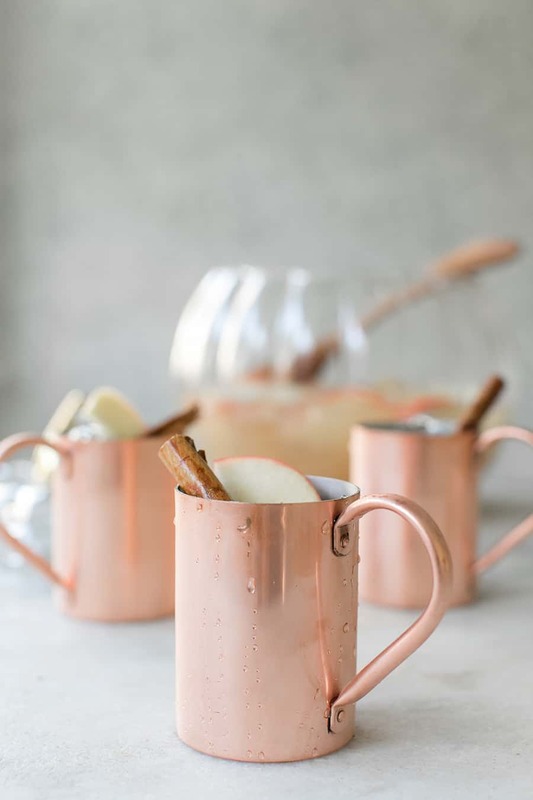 You can also serve wine since it goes so well with chili. I usually like to serve both a cocktail and wine. 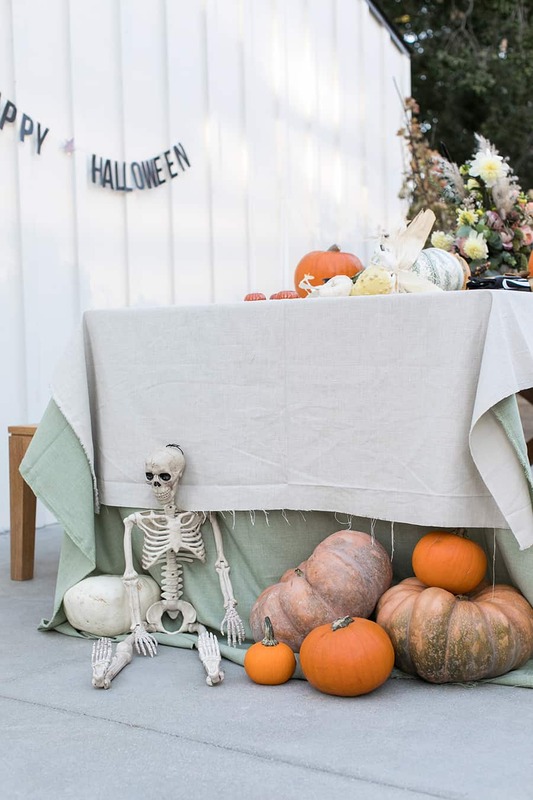 Here’s a tip that will make cleanup less scary: Place out a cauldron for the pumpkin seeds! 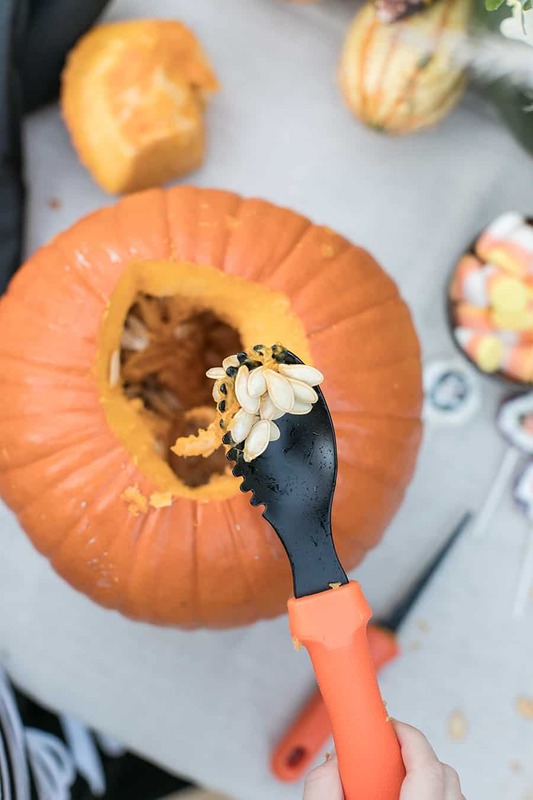 Most of the supplies are linked above, but some of the most important supplies are the carving tools, towels, pumpkins, black Sharpie for making faces on the pumpkins, pumpkin stencils, bowl for putting the seeds in, desserts and candy! 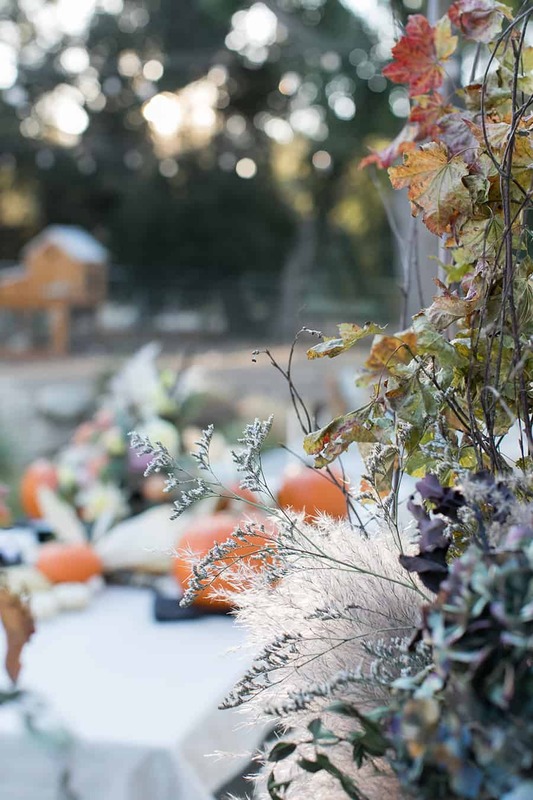 For the decor, line the table with pumpkins, fall corn and foliage. 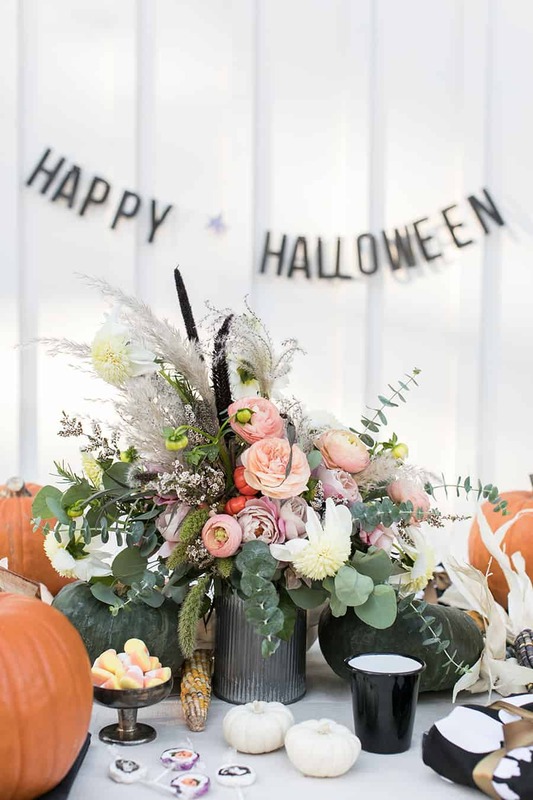 Add flowers as a centerpiece and bowls of candy down the middle. 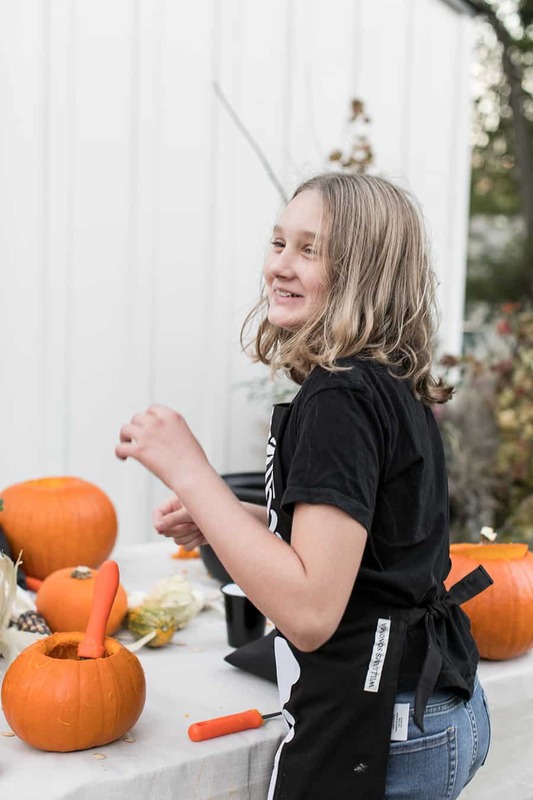 Turn up the Halloween tunes and carve away!